Module 1 is designed to encourage students to think about what drugs are, and the impact they have on our society. For this module, we define a drug as any substance that changes the way the body and brain work; examples include medicines, alcohol, caffeine, nicotine, and illegal drugs like marijuana and cocaine. 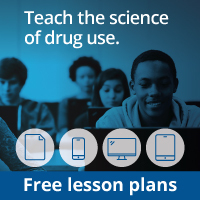 Students will learn the differences between legal and illegal drugs and find examples in the media that show how information about drugs is presented. Students may be surprised to discover that drugs are mentioned often in all types of media. After making this observation, students will have a better understanding of why drug use is such a serious problem to our society. During Module 1, students will look in magazines, newspapers, on the Internet, and in movies to find out how drugs are portrayed in our society. Students will discover that often drugs are shown as being enticing and appealing. Both men and women shown using drugs are, in some cases, attractive, well dressed, and look successful. The fact that drugs are paired with such positive qualities sends a confusing message to kids. Once the students learn how drugs are presented in the media, they will have a better understanding of why drugs pose such a serious problem to our society. This activity aligns with a standard identified in the National Science Education Standards, guidelines developed in 1996 by the National Academy of Sciences to help schools know what information should be covered in kindergarten through high school. This standard, science in personal and social perspectives, stresses the importance of understanding what drugs are and how they are used so that the students can learn how to make decisions that affect their health. Ask your child to help you find examples in the media that show how drugs are portrayed. Watch TV or a movie with your child, look through magazines and newspaper articles, listen to music, or surf the Internet. Discuss how the drugs are portrayed, and how the people look who are using these drugs. Talk to your child about these drugs and the confusion that can happen when the media portrays them in a positive manner. Why Do People Take Drugs? [Westcott, P.] Chicago, IL: Raintree Publishers, 2001. Students will find this book to be a good starting point when beginning to answer the question of why people take drugs. It covers the various cultural and individual perceptions people have about drug use and how laws governing it differ around the world. Drugs and the Media. [Lee, M. P.] New York: The Rosen Publishers, 1994. In a straightforward, concise manner, this book presents a variety of propaganda techniques in the media, including advertising, entertainment, and news.